Kelly McMillan with his lastest creation — the “ELR Beast”. The design team at McMillan Fiberglass Stocks is working on a new heavy-duty stock for the Extreme Long Range (ELR) game. This beefy gunstock is designed to handle the heavy torque and recoil of big-caliber cartridges such as the .408 Cheytac and .50 BMG. The stock is also designed to balance the ultra-long barrels favored by ELR shooters and King of 2 Mile competitors. Shown above is the boss-man himself, Kelly McMillan, with the new ELR stock prototype. Kelly calls this “the ELR Beast”. Note how the cheekpiece is slotted to allow unimpeded movement of the extra-long bolt. 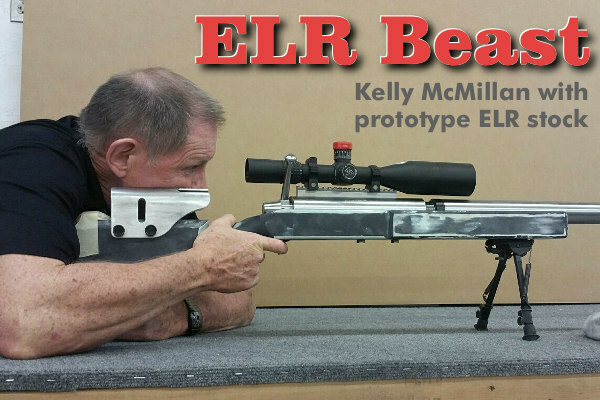 Share the post "Beast in the Works — New ELR Stock from McMillan"
That bipod is on backwards. The bipod isn’t on backward – the rifle is the wrong way round! !